TORONTO, ON – Mill Street Brewery has announced the release of its Spring 2015 mixed pack – one that will look quite familiar to those who picked one up last year, as it features the same pair of seasonal brands. Spring Thaw Maple Ale (5.3% abv): Smoked beers are near to my heart and this one in combination with Ontario maple syrup just screams spring. It has a very drinkable character and is very understated – don’t go looking for something to pour on your pancakes! The maple syrup is added to give flavour and not sweetness so it is added judiciously and the wood fired maple syrup from the Madawaska Valley near my cabin in northeastern Ontario is so intensely flavoured that you don’t need much. Portage Ale (5.0% abv): Named after a famous portage route around the Chaudiere Falls on the Ottawa River that is currently occupied by our Ottawa brewpub, this is a wonderfully refreshing light ale that epitomizes the traditional styles made by the brewers of Ottawa in the 19th and early 20th Centuries. This is real cream ale made the way it is supposed to be made with two yeast strains blended to give complexity and smoothness. The soft water of the Ottawa River is responsible for the incredibly light texture of this beer. 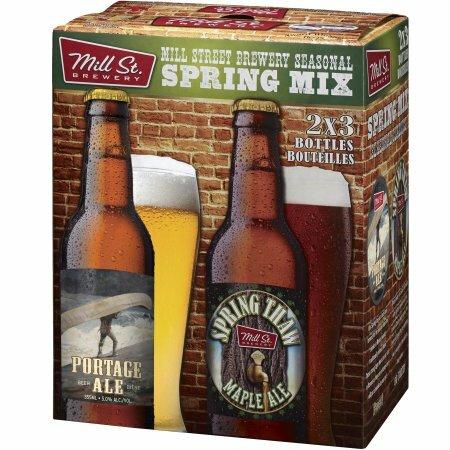 The Mill Street Spring Sampler 2015 is available now at select LCBO outlets across Ontario, retailing for $13.65 per pack.